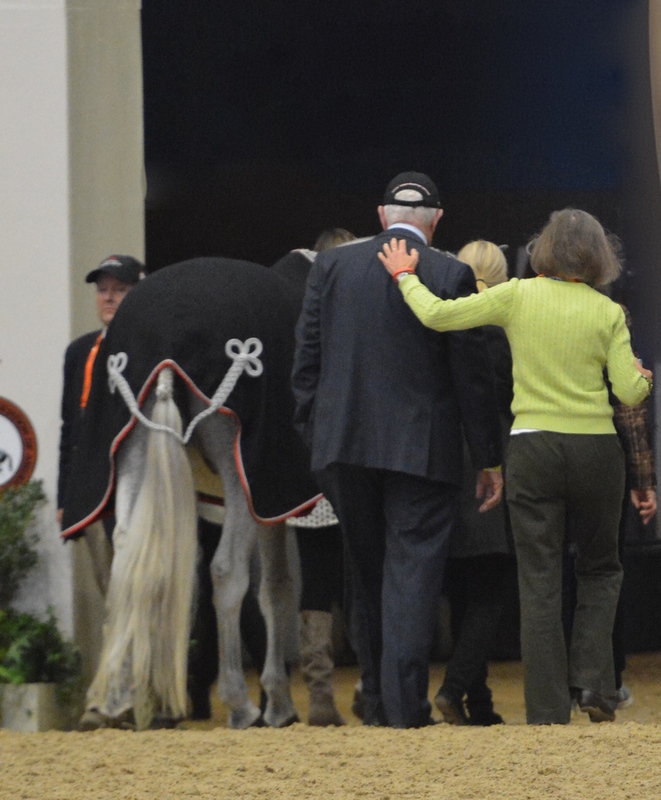 Lexington, KY - October 31, 2015 - You wouldn’t know the attractive grey horse, Lyle, was 22-years-old when owner Stephanie Keen of Ocala, FL, lead him into the Alltech Arena one last time at the CP National Horse Show this past week. His perky ears and kind eye showed his enthusiasm as he toured the ring, accompanied by some of his best friends, trainers and riders, and was officially retired at one of the places he had been Champion so many times. Lyle poses in his cooler with his riders listed, along with (left to right) Susan McConnell, Caitie Hope, Abby O'Mara, Erin Stewart, owner Stephanie Keen, Don Stewart, Bibby Hill, Leslie Steele and his long time groom. Photo Chicago Equestrian. The 15.3 hand Dutch Warmblood earned six National Horse of the Year Titles, won two Junior Hunter Finals, five Grand Championships at indoors and almost too many national championships to count, in his 14-year career. Caitie Hope, Barrington, IL, was one of the riders lucky enough to have the opportunity to ride Lyle. 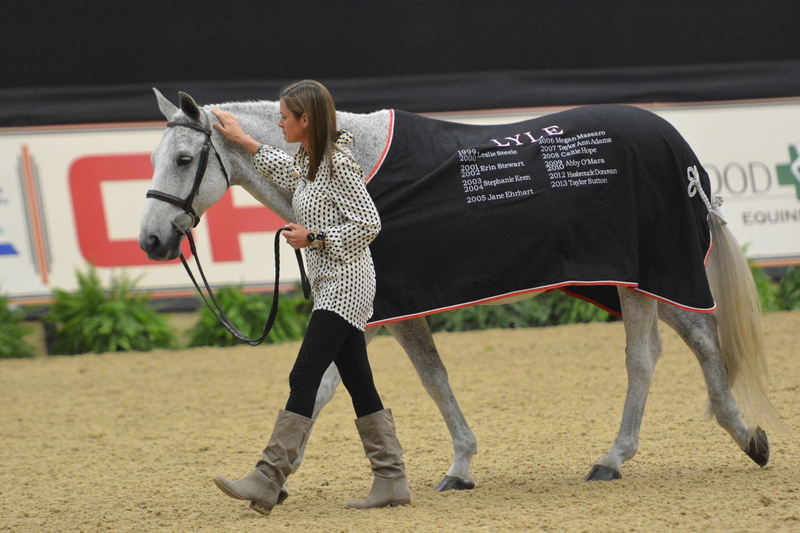 In 2008, Hope was the first junior rider to be Champion at three indoor finals with the same horse in the same year. The pair earned the Championship in the Small Junior Hunters at Capital Challenge, Harrisburg and Washington. 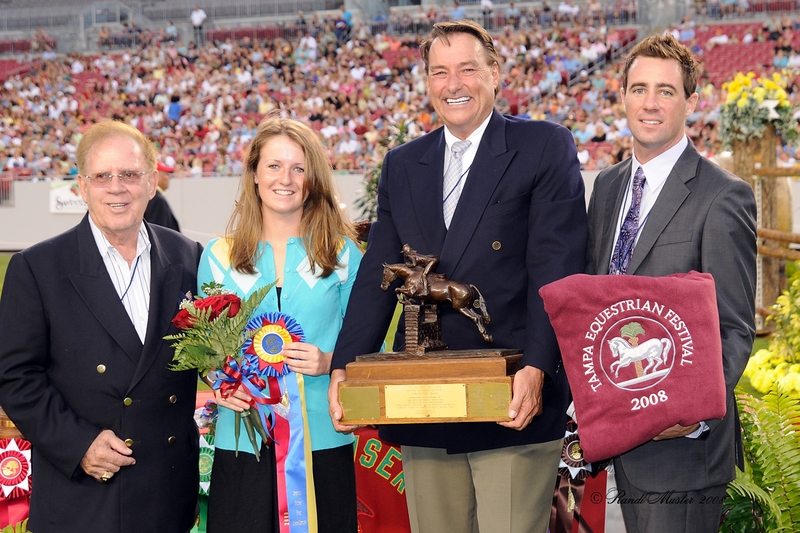 Lyle was named The Chronicle of the Horse’s Show Hunter of the Year. Caitie Hope received the Bill Fitch Sportsmanship award from Gene Mische, Mason Phelps and Tim Bolton. Photo Randi Muster. Hope earned the HITS Ocala Circuit Championship in the older Small Junior Hunters after earning four consecutive Championships on Lyle.Thanks to Lyle, Hope was presented with the William R. “Bill” Fitch Sportsmanship Award before the start of the $200,000 Budweiser American Invitational at Raymond James Stadium in Tampa. Hope then took home the Small Junior 16-17 Hunter Championship with Lyle at the Atlanta Spring Premiere Horse Show in Conyers, GA and continued on to win the Small Junior Hunter Stake class with Lyle at the Devon Horse Show. After a successful junior career, Hope now shows in the Amateur Owner Jumpers with her horses Total Touch and Vision EH . Don Stewart of Ocala, FL, was the glue that held the successes together. It was under his watchful eye that Lyle went to the ring and it was Stewart’s choice as to who earned the ride on the prestigious mount. "It was great to be a small part of the horses' career. We were only one year." said Hope's trainer Diane Carney. "Lyle only took four schooling jumps before any class so when we needed to practice it was always on a practice horse. At Capital Challenge, we went out and practiced galloping to the first jump on our practice horse. Then Caitie switched to Lyle, walked into the ring as the first horse of the day, galloped to the first jump and scored a 90 for their round. That's a moment you never forget because of Lyle." Lyle and Stephanie Keen take the last stroll around the ring. Photo Chicago Equestrian. “To Don Stewart, you were the backbone from the very beginning. Here we are 14 years later at his retirement ceremony. Without you, Lyle would not have had the career he did. Thank you for bringing each one of his riders into his life and for always wanting the best for him. There simply are not enough words to say Thank you! Lyle’s career began in 1999 when he was AHSA’s Horse of the Year in the Second Year Green Working Hunters and Reserve Champion at the Pennsylvania National Horse Show (PNHS) with Leslie Steele. He also earned the Championship in the Regular Working Hunters at the Washington International Horse Show (WIHS). In 2000, Steele and Lyle were Reserve Champions in both the Second Year Green Hunters and the Regular Working Hunters at Capital Challenge and the PNHS. In 2001, Erin Stewart rode Lyle to the Reserve Championship in the Small Junior Hunters 16-17 at the PNHS and in 2002, the pair won the Junior Hunter Finals – East. In 2003 and 2004, owner Keen, earned the Championship in the Adult Amateurs 18-35 at the Biltmore Summer Classic Horse Show. 2005 brought Jane Ehrhart as a junior rider, capturing the Hits Championship for the Small Junior Hunters. That was just the beginning of Lyle’s Junior Hunter winning streak. In 2006, Meagan Massaro earned the USEF Grand Champion Junior Horse of the Year Award and Small Junior Hunter Horse of the Year. Among many prestigious wins, the pair earned the Grand Junior Hunter Championship at the National Horse Show and were Reserve Champion Small Junior at Washington. Samantha Schaefer took the reins in 2007 to win the $25,000 Jacksonville Hunter Classic and Taylor Ann Adams earned Lyle the title again of USEF Small Junior Horse of the Year, Champion of the USEF Junior Hunter Finals 15 & under and the Grand Junior and Champion Small Junior at the PNHS. In 2008, Caitie Hope was the first junior rider to be Champion at three indoor finals with the same horse, among many other Championships in the junior hunters that year. The pair earned the Championship at Capital Challenge, Harrisburg and Washington. Lyle was named The Chronicle of the Horse Show Hunter of the Year. Abby O’Mara got the ride in 2009 and 2010, earing the Grand Junior Hunter and Champion Awards at the PNHS and the Championship at the WIHS. 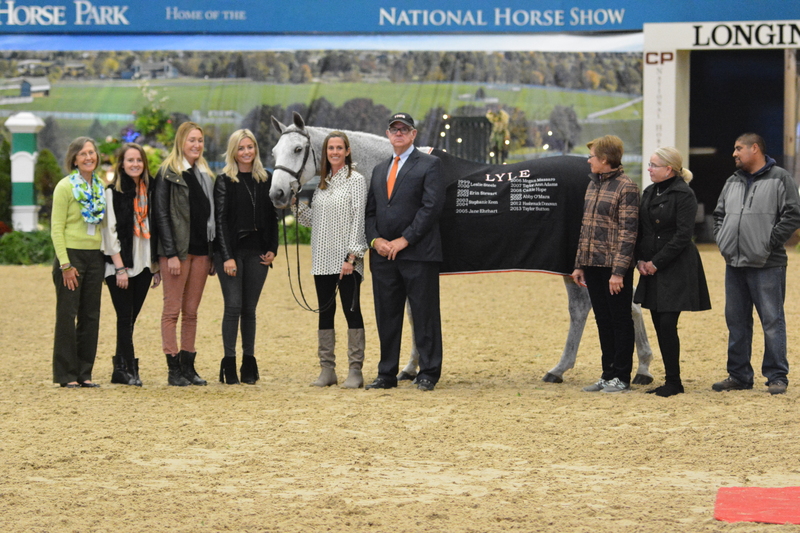 Lyle also earned the title, National Show Hunter Hall of Fame Junior Horse of the Year. Again in the winners, circle, Lyle and Hasbrouck Donovan took the Championship at the WIHS and the Grand Junior and Champion at the National Horse Showin 2012, followed by Taylor Sutton, earning the Grand Junior and Champion at the National Horse Show and Grand Junior Hunter at the Atlanta Summer Classic in 2013. Lyle exits the ring one last time, a Champion. Photo Chicago Equestrian. This past week, October 2015, Lyle was formally retired at a ceremony at the National Horse Show, where he had been the Grand Champion Junior Hunter three times.